The smokey smell of pallets burning over a backyard campfire, the sweet taste of marshmallows that have been over-charred from being in the fire for too long, and an evening tolerating all your friends in a confined space. Oh, winter bonfires. Okay, I’m just kidding about tolerating people, I actually really enjoy group activities. Especially when there is food involved. And while the snow hasn’t quite fallen yet and the winter bonfires are still a few weeks away, I’ll just bake. 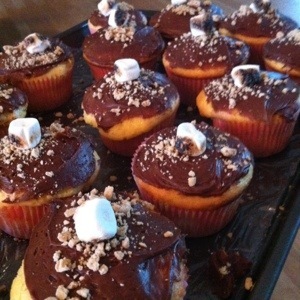 That’s ultimately what led to these s’more-inspired cupcakes. They still need a little work, but for my first go, I think I succeeded. Simple, cute, and a little rough painstakingly roasting mini marshmallows over an apple cider scented candle. Yeah, that last part happened. Anyway, all you really need is a yellow cake box mix, chocolate frosting, graham crackers, and mini marshmallows. You’ll also want on hand some toothpicks for the roasting part, you’ll see what I mean. Preheat oven to 350. Using the manufacturer’s instructions, mix together your cake mix. Now, I tried poking a mini marshmallow into the center of each one, but when it baked, well… those mini marshmallows disappeared. So it’s your call if you want to take the effort to see if they’ll survive a time in the oven. Bake for 18-20 minutes, or until a toothpick can be inserted in the cupcake and removed clean. Set aside and let cool completely. In a Ziploc bag , place four to five graham crackers. Seal bag, leaving as little air in it as possible, and a corner open. 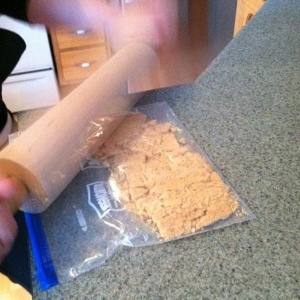 Take a rolling pin and roll over the crackers until crushed. Leave a few little bits, try not to make it a complete powder. Light a candle (or use your gas stove top if you have an open flame, candle works fine though.) Carefully place a marshmallow on the end of a toothpick and heat over flame. I purposely burned them just a bit to give them a campfire look, but you can be patient and toast them until golden brown, your call. Remove from toothpick and set aside until you’re ready to decorate cupcakes. This is tedious, but the end result is adorable. After cupcakes are cooled, frost with chocolate frosting and sprinkle graham cracker powder on top of cupcakes. Place a single toasted marshmallow on each cupcake. Serve and enjoy.